International Journal of Research in Health Sciences,2015,3,2,373-382. 1-Assistant Professor, Department of Pathology, Sir Ronald Ross Institute of Tropical and Communicable Disease, Nallakunta, Hyderabad, INDIA. 2-Professor of Medicine/ Superintendent, Sir Ronald Ross Institute of Tropical and Communicable Disease, Nallakunta, Hyderabad, INDIA. Background: Communicable diseases remain the leading cause of mortality and morbidity in developing countries as disease patterns change constantly. Seasonality for these diseases is a common phenomenon in all regions. However, the mechanisms responsible for the epidemiological consequences of this seasonal variation are poorly understood. For this the knowledge and analyzed proper data of seasonal variation is required. Thereby we can prevent the major outbreaks. 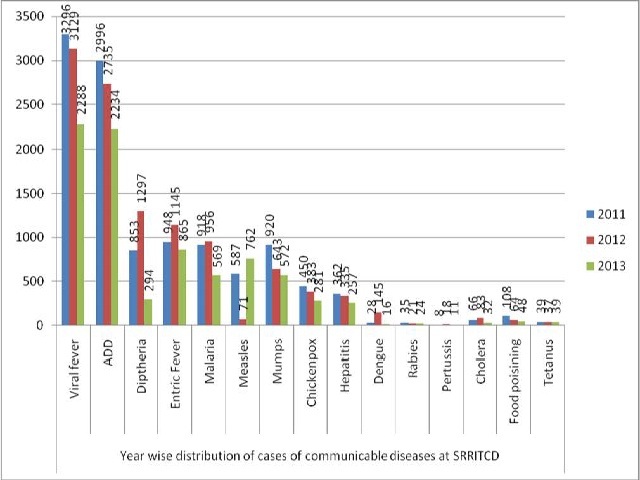 Objective: The objective of this study are to determine the seasonal variations of communicable diseases admitted at Sir Ronald Ross Institute of Tropical and communicable diseases (SRRITCD), Hyderabad and to suggest preventive and curative measures. Materials and Methods: All patients who were admitted at this hospital over a period of three years (January 2011 to December 2013) have been studied. The patient data was documented for each case and further categorized into viral fevers, acute diarrheal diseases, enteric fever, malaria, rabies, measles, mumps, chickenpox, diphtheria, and pertussis. The seasonal variations for these diseases were analyzed. Results: Results showed that a total of 34,981 had been treated at the inpatient departments from the year 2011 to 2013. It was observed that, while communicable diseases constituted about 85% (30,082) of the total disease burden with viral infections being the commonest. Most of the diseases were observed to have a seasonal variation. The most common disease identified was viral fever 8713 (28.96%), secondly acute diarrheal diseases 7965(26.52%) followed by enteric fever 2958 (9.83%) and malaria 2443(8.12%). The least common were Rabies 80 (0.26 %) and pertussis 37 (0.12%). Outbreaks of Measles and Diphtheria were also noted in this study. Conclusion: Many diseases have a seasonal variation and the burden of these diseases could be reduced if we device measures to detect the changes in their trend through the implementation of surveillance programs. The knowledge of the burden of these diseases would also assist the health administrators in allocation of the resources.